August news: After-sales + EXCLUSIVE Offers from David Norden..
Find below the Exclusive offers ending Sunday around 8 p.m. Belgian time.. Please be aware that you will get free worldwide delivery and a complete description for every piece. Also note that I sometimes include an extra free object in the package! The catawiki auction costs are very low compared to other auction sites – only 9% of the hammer price. I also still have some objects available from the Kuba sale, if you want you can buy them now at a low fixed price during the next few days, see below.. The Royal Kuba Art Treasures below are available in After-sales, you can buy them directly from me at the mentioned fixed price, no extra auction costs on those items,and of course free worldwide delivery and a complete description for every piece. . .
Just reply to this email to check availability and get payment instructions ( wire transfer, credit card, or Paypal), you can view the complete description and extra images on Catawiki by clicking on the links near the images, but you can't bid on Catawiki on those items. If you are interested just hit the reply button. From the collection of Bob Germ, Hoboken, USA. H= 30 cm, +/- 54 cm, with the fibers part. Crack and indigenous restoration on the side, hole on top. 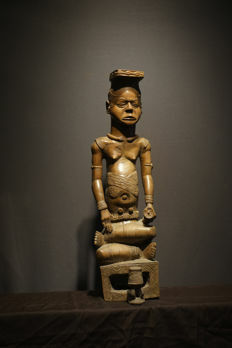 Provenance: Maria Wyss, merchant expert and collector of African Art, who lived in Basel (Switzerland) in the 1960s and 1970s. She was well known in the collectors and museums community for her good taste and knowledge, and for mounting major public exhibitions of beautiful pieces. She worked with many museums and major private collectors. Entered the Norden Collection from “Jo the Buck” a long time ago. 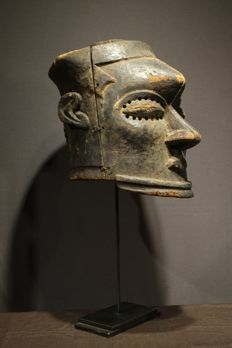 Collected in the 1950's, this Kuba-Kete Helmet Mask is quite impressive. Provenance ex-collection Jan Kusters, Netherland. H= 43 cm and 65 cm with the feathers, 70 cm on it's stand. Pwoom Itok mask from the collection of Jan van Camp, Antwerp, Belgium. 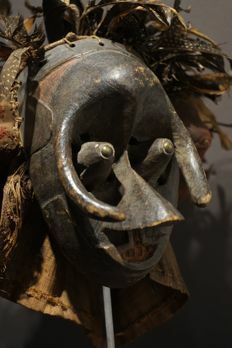 Wood, feathers, raffia, copper nails in the eyes, remains of Tokula powder. 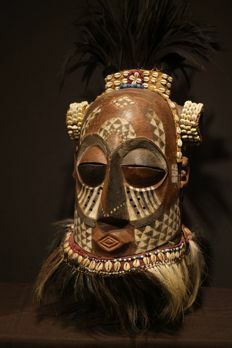 Kuba artists of south-central DRC create friction oracles known as itombwa. 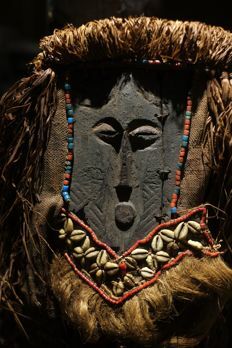 Regarded as infallible divinatory instruments, itombwa were used by the Ding, Kuba, Lele, Luluwa and Wongo peoples to mediate between diviners and omniscient nature spirits in order to determine the cause of illnesses and appropriate courses of treatment, as well as to expose dishonesty. W= 32 cm. Wood, complete with rubber and rope, black pigments, camwood powder remains, fine patination, and extensive signs of use. 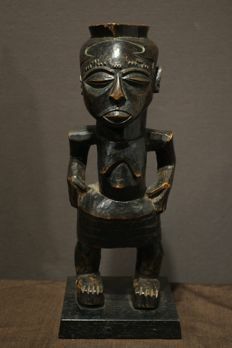 A fine Lele Itumba friction oracle; half man, half animal. W= 33 cm. Wood, complete with the rubber and rope, black pigments, fine patination , and extensive signs of use. 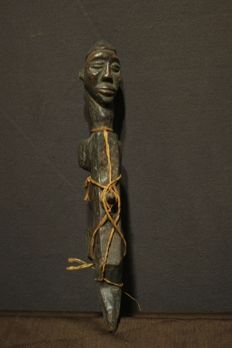 A fine Kuba Itumba friction oracle with two heads; half man, half animal. W= 31 cm. Wood, complete with rubber and rope, black pigments, fine patination , and extensive signs of use. On a wood stand. H= 30 cm, 33 cm on the custom-made wood stand. Rich dark-brown wood shiny patina, with underlying oxidised wood. Left foot reglued. It is quite seldom to find such cups with complete figures. Provenance: Jean Marc Desaive, Brussels. 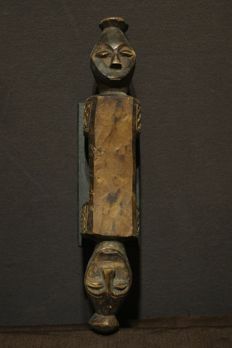 Provenance: Paul Gilman, a collector in Liège who had a lot of Kuba materials. 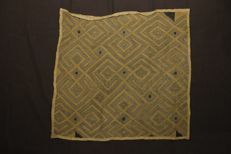 The Kuba people of the Congo are well known for textiles such as this, made from raffia and featuring interlocking knot designs. 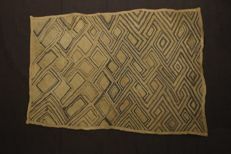 The men weave the cloth and the women embroider it. 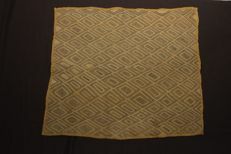 The characteristic pile (known as Kasai velvet or clipped pile cloth) is made by embroidering the cloth with soft, thin strips of natural and dyed raffia, which are clipped to make a velvet-like surface. 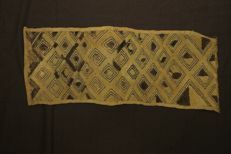 The fabric is a prestige item traditionally used as ceremonial clothing and for exchange, especially as part of a marriage contract. 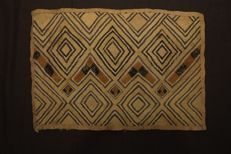 The first exhibition of Kuba material was in 1910 in the British Museum, with objects coming from the Hungarian ethnologist Emil Torday. It took me two years to assemble this collection, and I hope you enjoy it. Wishing you a happy bidding and a summer of love !